One of the greatest pleasures of Autumn is pumpkin pie. I wasn’t converted until I was well into my twenties; the idea of vegetables in desserts didn’t sit well with me. Nowadays, as soon as the weather turns cooler I start to think of the creamy deliciousness of my own homemade pumpkin pie. I got this recipe from Terri, who took me under her wing when I was at theatre school and away from my family for the first time. Whether for Thanksgiving, Hallowe’en, or just to celebrate Fall and harvest-time, this easy pumpkin pie recipe is exactly the thing you’re looking for. As with all of my sweet recipes, I go lighter on sugar than most; made to my recipe, the pumpkin flavour comes through beautifully. If you’d like to make your own pie pastry (I recommend it! It’s easy! ), you can check out my pastry recipe. This recipe makes 2 smaller pumpkin pies (when I bake it in my Emile Henry 9″ pie dishes, it only makes one very full pie). 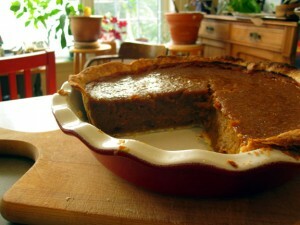 I always buy a pie pumpkin and make my own puree; the canned stuff is fine, but I like the smell of roasting pumpkin. You can also substitute butternut squash for pumpkin; the stuff in the can is usually butternut squash, anyway. Leave a comment to let me know how your pie turned out! One ripe pumpkin, smaller then your head. Halve pumpkin crosswise and scoop out the guts. Bake uncovered on a baking tray, hollow side down for 1 1/2 – 2 hours, until ‘fork tender’. Whatever that means. Scrape pulp from shells; blend with a fork. Mix pumpkin puree and sugar until sugar dissolves. And remaining ingredients, stirring well to blend. Slop filling into pie shells. Bake at 350F for 40-45 minutes. Pie is done when a knife inserted midway between centre and rim of pie comes out clean. You should really let it cool a bit before eating it; otherwise the centre might not be set, and you’ll probably burn your tongue. That’s a nice looking recipe that will probably make a great pie.